I'm in an art class right now that is covering the basics of art and such. It's called the artist's experience. The professor is making us start a blog and write down our thoughts about some of the stuff we talk about it class, all of which is super broad and overwhelming. I just wrote this up and wanted to hear what you guys think about art and what it is. Because when you actually stop & ask yourself, "What is art?" it's almost impossible to really answer. What is art? Art is full of intention. All that matters to me is that art means something to whoever created it and that everything was thought through. It’s an important concept that most people overlook when thinking about art. Art is any intentional piece. Art can tend to be different from craft. Originally, when I thought of craft, I thought of it as art. As a crafter myself, I would like to think that everything I make is art, but thinking of it within the scope of intention, I am realizing that not all of things I craft are not art. I don’t think some piece through and give thought and meaning to it, I just make something pretty and put lots of love into it. For sure, craftsmanship is a very important part of art, but it isn’t defining in itself as art. The importance of intention in art can be seen in digital pictures. With the invention of the digital camera, pictures are everywhere and have lost their seeming novelty. People take pictures of everything and certainly not all of it is art. Most people take pictures of things to record events and memories, and this isn’t necessarily art. Mindlessly recording an event isn’t art, but many artists are taking pictures of the seemingly mundane things of life and turning that in itself into a beautiful photo. The different is intention. The importance of setting and context regarding art is huge, which falls into the realms of intention guarding a piece. Ty mentioned a man who placed a urinal in a gallery and called it art. 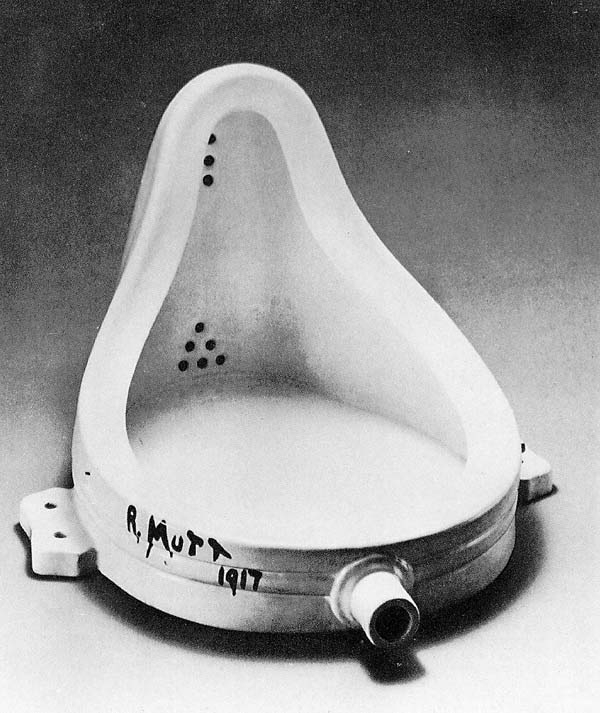 Marcel Duchamp submitted a urinal to a gallery as a piece titled ‘The Fountain’. The gallery said they would display all art that was submitted, but they didn’t submit Duchamp’s piece. Duchamp seemed to be testing the limits of what and what can be accepted as art, and isn’t that in itself a beautiful piece of art, asking more and more questions? Urinals identical to the urinals in bathrooms have been in galleries since then. The only thing differentiating these urinals are the concepts attached which are realized in a gallery which places them in a different context. They’re out of context and questions start to form about their odd presence, which is what intentional art should be doing. As art is full of meaning, general society seems to reserve the understanding of art for the rich, separating art from the bigger community. In Conversations Before the End of Time, Suzi Gablik and Ellen Dissanayake talk about how art should be for society. They said that individuals used art to define your place in the community, and now individuals use art to set themselves apart from the community. Ultimately, it is the growing importance of the individual that is driving society apart, but now art is becoming a part of that. Art should be for society. Art should be for everyone. Everyone should define art and everyone should create art, and in some way everyone does. I mentioned earlier that art is full of intention. So, how can everyone be creating art if they don’t even know it? If it’s not even intentional? Because nobody lives without intention. Art is commonly limited to art school mediums, such as paint, charcoal, glass, but art can be anything. Julia Scher is an artist who works with surveillance themes and ideas that go along with that. Her book, Security by Julia, is fascinating and brings up questions that you could find yourself asking through any regular surveillance system. It is simply asking the questions and presenting it a different matter that makes it “art”, the setting and context. I have touched on a few questions that came up in class but my answers have lots of holes and loose ends. Art is such a huge concept with so many aspects; it’s overwhelming to think about for so long. But one thing is for sure: art is important and necessary. Dissanayake stated that art is a biological need, which we can see from looking at history and how all societies have some form of art. Art as a biological need? I love that.